Several MBNL members participated in the Midlands Heart Walk to support the American Heart Association, a current supporter of ongoing stroke research in the lab. It was a great day for a walk! The MBNL gave a talk at the annual SCPATA meeting entitled "Challenge and Progression during Task-Oriented Arm Training after Stroke: Guiding Principles and Practice Applications". The team prepared hard and did a great job. A huge congrats to Kaci Handlery, Allison Lewis, and Olivia Lockhart! 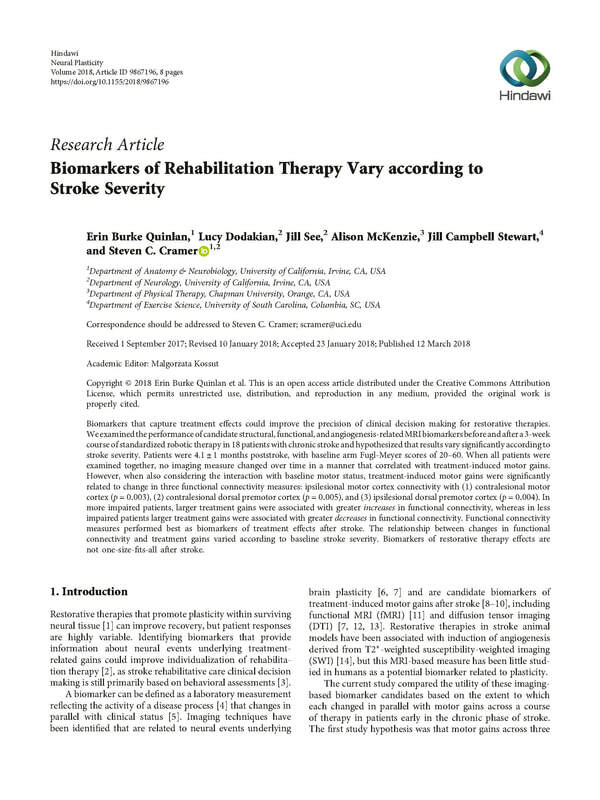 Dr. Stewart and previous MBNL member Janelle Rocktashel just had the paper "Self-efficacy and reach performance in individuals with mild motor impairment due to stroke" accepted to Neurorehabilitation and Neural Repair. We enjoyed having Jennapher Lingo Vangilder visit the MBNL from the Motor Rehabilitation & Learning Lab at Arizona State University. She gained some experience in the analysis of diffusion weighted images and we learned a lot about the superior longitudinal fasciculus. Makenzie Meyers successfully defended her Honor's Thesis titled "Test-Retest Reliability of a Measure of Corticospinal Tract Integrity after Stroke". Congrats Makenzie! 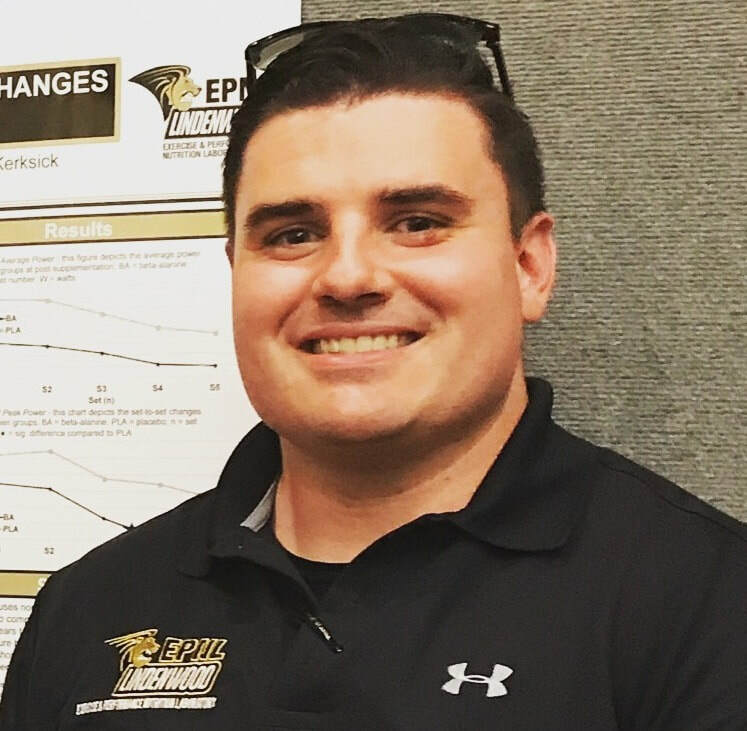 Ali Lewis, PhD student, presented a poster titled 'Reliability and minimal detectable change of fractional anisotropy of the corticospinal tract in chronic stroke' at the Combined Sections Meeting of the APTA. 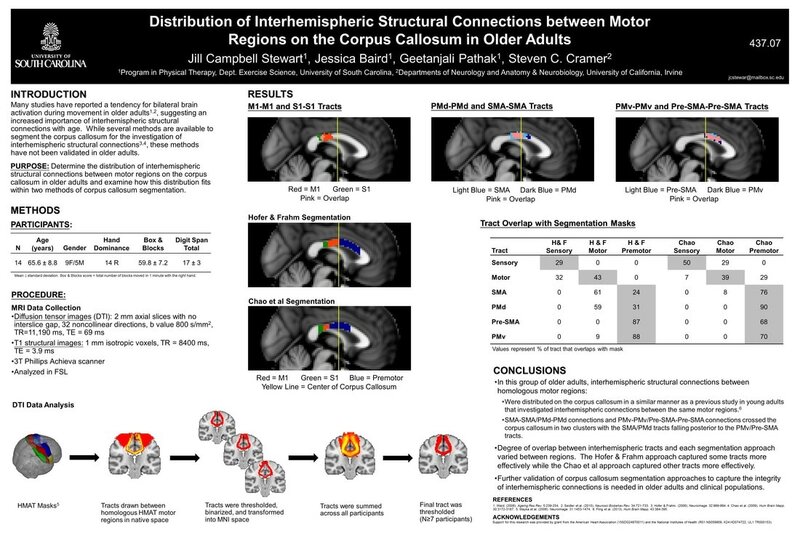 She was awarded 'Best Poster Award-Basic or Applied Research' by the Stroke Special Interest Group of the Academy of Neurologic Physical Therapy. Congrats Ali! Ali Lewis, PhD student, was awarded a SPARC Research Grant from the Office of the Vice President for Research to support her dissertation research. A big congrats to Ali! be found, but much fun was had! The MBNL was well represented at SFN 2018 in San Diego by graduate students Charles Smith and Allison Lewis and undergraduate student Makenzie Myers. All did a great job with poster presentations. Another successful conference! Dr. Stewart had a platform presentation at the American Society for Neurorehabilitation annual meeting in San Diego. Great meeting! Congrats to Jessica Baird - her second dissertation publication was just accepted for publication in Neurobiology of Learning and Memory. Charles Smith and Allison Foster Lewis, PhD students in the MBNL, have been awarded a 2018 Arnold Fellowship. These fellowships were endowed by Norman J. Arnold and are given to graduate students in the Arnold School who have the potential to positively impact public health. Congratulations to you both! First MBNL meeting of the 2018-2019 academic year. It's going to be a great year! Congratulations to Elizabeth Rizor and Jenny Heiser Discover USC Poster Award winners! Elizabeth received first place and Jenny received second place for their poster presentations. Discover USC Day! The MBNL was well represented by our undergraduate members. Mary Gaughan, Jenny Heiser, Austin Hetherington, Makenzie Myers, and Elizabeth Rizor, all presented research posters. Several MBNL members participated in the American Heart Association Walk as part of the Arnold School of Public Health team. We enjoyed a 3-mile walk as a lab! Melissa Kolar successfully defended her dissertation titled "Enhancing dancing: Examining the potency of a combined action observation and brain stimulation intervention". Congrats to Dr. Kolar! Dr. Stewart collaborated on a paper published in Neural Plasticity. Elizabeth Rizor successfully defended her Honor's Thesis titled "Functional Neural Correlates of Hand Motor Function Differ Based on Level of Motor Severity in Individuals Post-Stroke". Congrats Elizabeth! 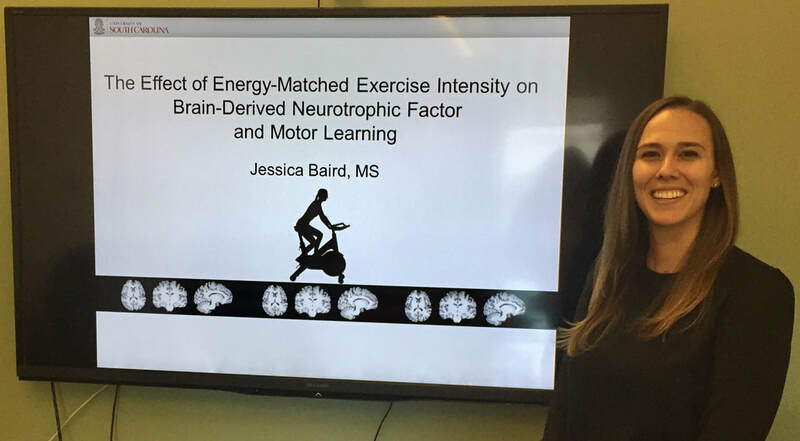 Jessica Baird successfully defended her dissertation titled "The Effect of Energy-Matched Exercise Intensity on Brain-Derived Neurotrophic Factor and Motor Learning". Dr. Baird is off to a postdoctoral research fellowship at University of Alabama at Birmingham. Congrats Dr. Baird! The MBNL was well represented at the Society for Neuroscience (SFN) and American Society of Neurorehabilitation (ASNR) meetings in Washington DC. Posters were presented by two graduate students – Jessica Baird and Elizabeth Regan – and two undergraduate students – Elizabeth Rizor and Austin Hetherington. Great job by all! Jessica Baird and Dr. Stewart published an article in Experimental Brain Research. Undergraduate research student Makenzie Myers received a SURF research grant from USC Honors College. Great Job Makenzie! PhD student Jessica Baird successfully defended her dissertation. Congratulations Dr. Baird! Dr. Jill Stewart collaborated on a paper published in Human Brain Mapping. Welcome PhD student Charles Smith to the lab! The MBNL had a farewell lunch for Janelle Rocktashel who completed her Masters Degree in Exercise Science. Dr. Stewart along with colleagues published papers in Neurorehabilitation and Repair and Journal of Neurologic Physical Therapy. Physical Therapist Allison Lewis has joined the MBNL as a new PhD student! We are glad to have you! Elizabeth Rizor, undergraduate researcher, has been accepted to attend the Colorado Summer Institute in Biostatistics in Denver. Great job, Elizabeth! Undergraduate researchers Heath Saffer and Kelly DeAngelis graduated from USC. Heath will be heading to the University of Copenhagen in Denmark for their Human Biology program. Kelly will be heading to Physical Therapy School at Arcadia University. Congrats and good luck! Congratulations to Discover USC Poster Award winners Austin Hetherington, Kelly DeAngelis, and Elizabeth Rizor! Discover USC Day! The Motor Behavior and Neuroimaging Lab was well represented. Jessica Baird, Kelly DeAngelis, Mary Gaughan, Austin Hetherington, Elizabeth Rizor, and Health Saffer all presented research posters. Austin Hetherington, undergraduate researcher, received the Magellan Scholar Research Grant from the USC Office of Undergraduate Research. Congrats, Austin! A paper by Dr. Stewart and colleagues was published in NeuroImage: Clinical journal. ​Jessica Baird was named a PhD Student Poster Award Finalist at the Southeast Chapter of the American College of Sports Medicine Conference. Great job, Jessica! 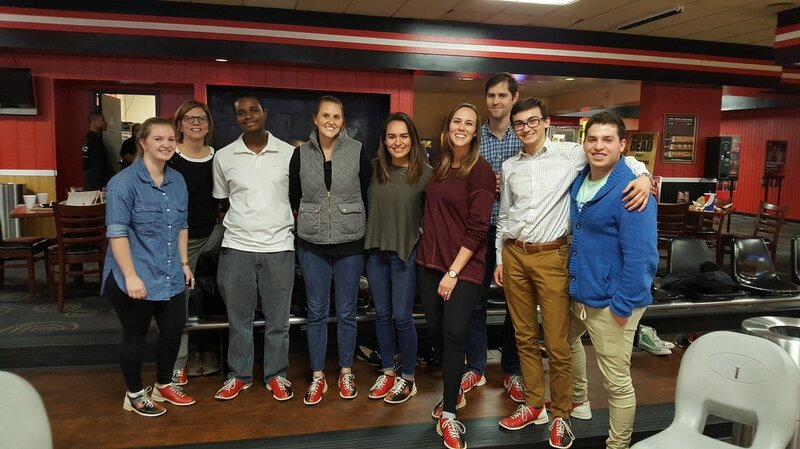 The MBNL went bowling – matching shoes and all. We learned that Austin has a hidden talent for bowling! Mary Gaughan, undergraduate researcher, received a Magellan Mini-Grant Award and a Magellan Apprentice Award from the USC Office of Undergraduate Research to support her work in the lab. Congrats Mary! The lab presented two posters at the annual Society for Neuroscience Meeting in San Diego. PhD Candidate, Jessica Baird, was awarded a 2016-2017 Arnold Fellowship from the Arnold School of Public Health at USC. This prestigious award is given to outstanding PhD students in the School. Congrats Jessica! Dr. Stewart gives talk on genetics and rehabilitation at the IV STEP Conference in Columbus, OH. ​Ashley Saba, DPT student, gives a platform talk on her research at the NASPSPA Conference in Montreal, QC. Great job, Ashley! One of our long-time research assistants, Anjali Pathak, is heading to Medical School at the University of South Carolina this summer. Thanks for all your hard work, Anjali, and good luck! Undergraduate research students Elizabeth Rizor and Austin Heatherington received SURF research grants from USC Honors College. Congrats! Morgan Durand and John Pai won a 2nd Place Poster Award at the USC Undergraduate Discovery Day. Great job!